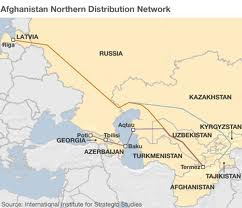 A United States military officer stated that if Pakistan fails to reopen Nato supply routes, the US will have to rely on India and the Northern Distribution Network (NDN). Addressing the Readiness Subcommittee of the House Armed Services Committee on Wednesday, Marine Corps Lieutenant General Frank Panter, the Deputy Commandant for Installations and Logistics told lawmakers that relying on NDN are expensive propositions. He added that negotiations with Pakistan regarding reopening of supply routes are still going on. If Pakistan’s ground routes are not reopened for Nato supply, Lt Gen Panter said the re-deployment timelines will also increase.